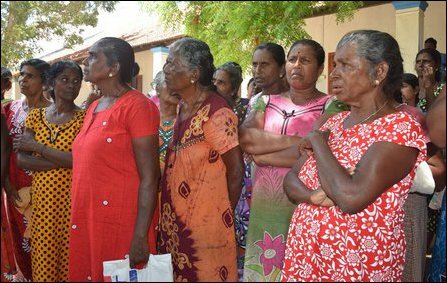 The people uprooted from Mu'l'lik-ku'lam 10 years ago were waging a continuous protest for 38 days until 29 April when they received an assurance from SL Navy commander on behalf of the Commander-in-Chief of the occupying SL military Mr Maithiripala Sirisena that 100 acres of their lands would be released within 3 days. But, on Tuesday, 10 days after the assurance, the families who entered the military zone and camped inside buildings of a church and school were told only 77 acres would be released and that too after they document papers for their lands. 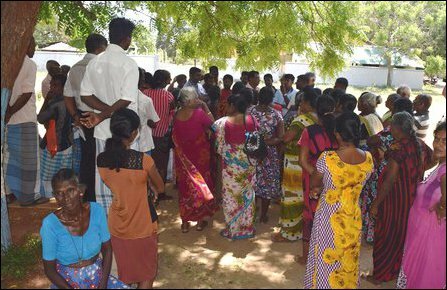 The SL Navy wants 8 more months release the remaining 33 acres, Divisional Secretary S. Vasanthakumar told the people who were awaiting the release of their lands. The people are residing inside the military zone. “We have no freedom of movement. The entire area is a military zone. SL Navy commanders are staying in my house. The SL Navy commander has lied to us. SL President Maithiripala Sirisena sent the military man to lie to us on behalf of himself,” said a mother who did not wish to be named in the news. Her house is lying inside the 33 acres of lands where all the remaining 27 houses are located. The SL Navy is refusing to release all these houses. It is asking 8 months to find alternative arrangements for the commanders. “It is going to be like Champoor. They are going to build a Sinhala military colony here,” the mother said. The uprooted people say that the SL Navy was not prepared to de-militarize Mu'l'lik-ku'lam village. Each time, they come with different excuses and false promises, the mothers who were gathered at Mu'l'lik-ku'lam church said at the presence of Chilaavaththu'rai Parish Priest Rev Fr Anton Thavarasa. The Tamil people were initially chased out from their houses 10 years ago. The SL Army that seized the village said the people could come back to their village after 3 days. Their resettlement was however refused by the SL Army. Later, SL Navy moved in and transformed the entire village into their ‘North Western Naval Area’ command Headquarters. But, the people were let down to languish without proper infrastructure and livelihood at Kaayaa-kuzhi and Malang-kaadu while SL Navy personnel were occupying their houses at Mu'l'lik-ku'lam. 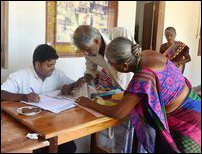 The uprooted people were not even provided with humanitarian assistance or compensation as promised by Gotabhaya and Malcolm Ranjith. The uprooted Tamil Catholic people were continuing their struggle with the demand of getting back to their original village that provided fertile lands and access to coastal stretch for fishing since fifteenth century.